This book is an historical account of the lives and works of artists, sculptors, and engravers from a town near Venice, Italy called Bassano del Grappa. Local historian and author of the book, Giambatisti Verci (1739-95), has chosen a frontispiece that reflects the content of the book. The name of one of the most prominent painters from Bassano, Giacomo da Ponte, features in the engraving. Da Ponte, who became known as Jacopo Bassano (1510-92) was influenced by the likes of Dürer and Raphael; and is known as the ‘first modern landscape painter’. 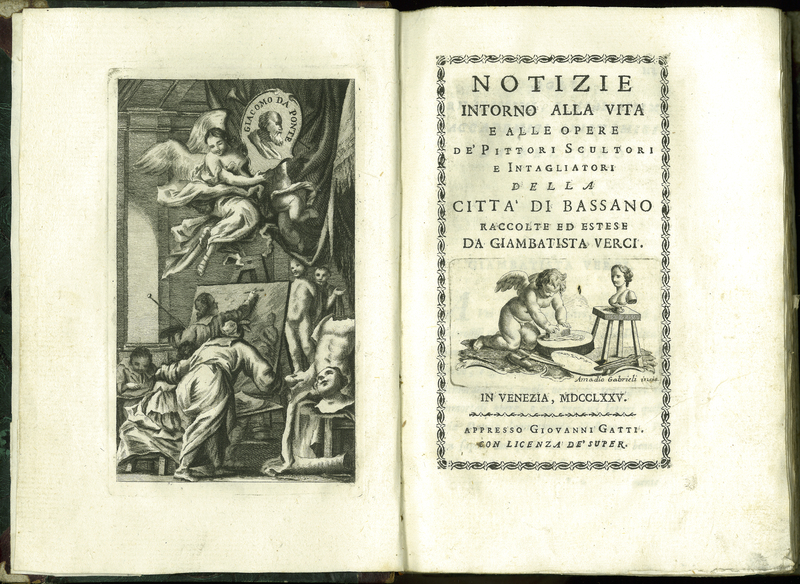 Giambatista Verci, “Notizie Intorno alle Vita e alle Opere de’Pittori, Scultori, e Intagliatori della Citta’ di Bassano,” ourheritage.ac.nz | OUR Heritage, accessed April 22, 2019, http://otago.ourheritage.ac.nz/items/show/10716.